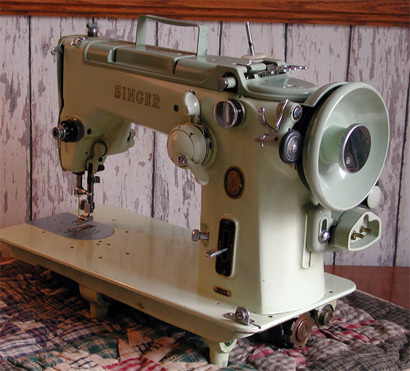 Pictured above is our green Singer 319W sewing machine. It was purchased during February 2008 at our local Goodwill store for $25.00. While it wouldn't run when we brought it home, a little cleaning and oiling and coaxing got it going just fine. Serial number of our 319 is W1704320. The first look at the 319 is somewhat intimidating. There are a lot of knobs and levers whose use is not apparent at first. However, after spending quite a bit of time reading the operator's manual (something Jim hates to do), use of the controls seems straightforward. This is one machine that you'll definitely need the manual. This good-looking Singer 319W came in a not-so-good-looking cabinet. The machine was removed from the cabinet for cleaning and oiling and to get its picture taken. 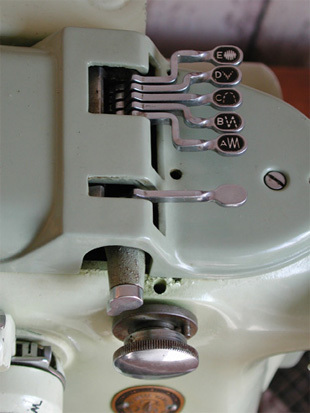 The 319 has five built-in stitch patterns by raising levers on top. 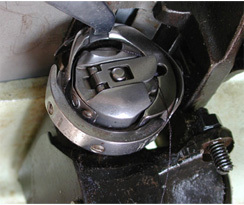 The bottom lever (lever toward operator) is raised when Fashion Disks are used--see image below. 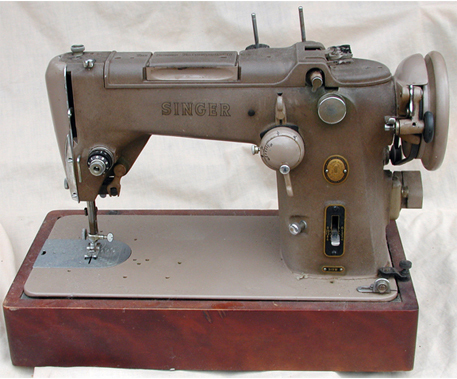 Additional stitch pattens can be produced using Fashion Disks or "cams" which the operator installed as needed. A list of the disks can be found below.The large painted control is used to select stitch width and needle position (left to right). 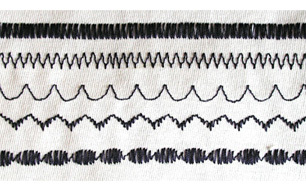 Also a control allows stitch patterns to be altered by printing part of either the left or right side. The external motor drives a second internal belt drive. The fiber belt can be seen to the left. We don't know what the longevity of these belts is, but we certainly hope we never have to change one. This is one belt that--because of its design--will never slip. It works like the track on a bulldozer. The fiber belt drive may be quieter than gear drive. A complaint that we have is the location of the bobbin. 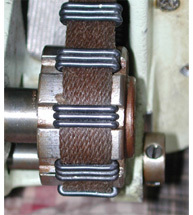 The vertical bobbin is mounted in an orientation that seems difficult to reach compared to some of our other machines. We took a file to the bobbin case to remove battle scars received when the needle impacted it. Probably the result of tugging on fabric while sewing or changing dials when the needle is not up. The five patterns above were produced on our green machine using its built-in cams. Stitch width was set at 5 and stitch length was set at about 25 stitches per inch. This brown Singer 319W is not very pretty. In fact, we think it is on the ugly side but it will sew about anything you can get under the presser foot. This appearance of our unit is partly due to the brown crinkle paint. It is difficult to remove the old dried lubricants used over the years. When we get the time, we plan to sit down with it and a small scrub brush (such as a sacrificed tooth brush) and a mild detergent. Fortunately, Singer didn't decorate the finish with scroll work as was done on earlier machines. When we acquired the 319 it had no Fashion Disks. We ordered over 20 disks from a source in Canada during December 2006. Notice the balance wheel extends beyond the wood base. A wood base is required for the machine to sit level if it is not installed in a cabinet. This unit resides in a carrying case designed for it with a built-in adapter to store the foot control. We were told by a dealer that the 319 was a "bust" for Singer because of its complexity. Apparently seamstresses were a bit intimidated by all the levers, dials and cams. The rotating external cams were something she didn't want to get her flaxen hair caught up in. It also was apparently a point of interest for little boys with curious minds. This probably accounts for the relatively short period of production-- from 1955-57. Made in Bridgeport, Connecticut at the old Wheeler & Wilson facility (hence the "W" designation in 319W). We have seen other 319Ws in green and black. You need 206X13 needles and bobbins that are listed for a Riccar Rotary. 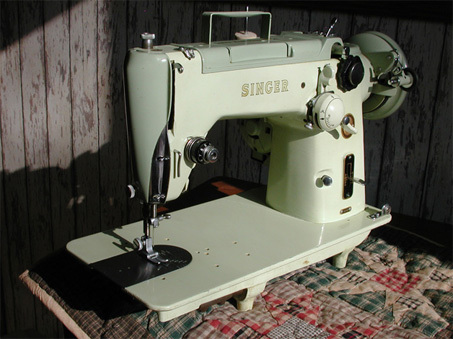 The standard needles for a Singer 319--the 206X13--is still being produced and can be ordered from a number of sources. Buy enough to last as long as you plan on owning the machine. The 319 also uses a twin needle 306X3 which we were told and are no longer made and may be hard to find. We like the machine for the seam it sews. It is a heavy and quite substantial unit and built very well. It would appear that it was the Edsel of its day. 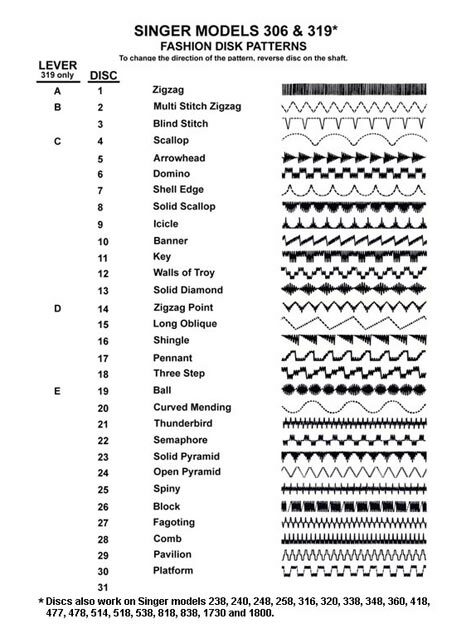 Below is a table showing the various Fashion Disk Patterns.